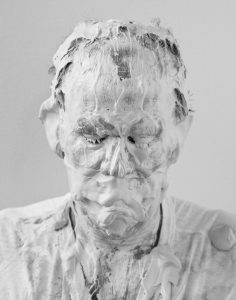 Artist and educator Chris Staley will visit The University of Alabama campus November 10 to present ceramics workshops and an artist lecture in the midst of an ongoing exhibition of his work in the Sella-Granata Art Gallery. 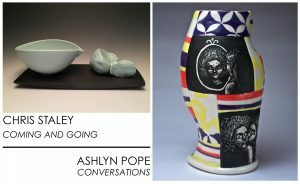 Staley’s exhibition, Coming and Going, will be on display November 3 – 22 in the Department of Art and Art History’s Woods Hall gallery in a dual exhibition with artist Ashlyn Pope. On Thursday, Nov. 10, Staley will give two workshops and demonstrations in the Department of Art and Art History’s Bureau of Mines ceramics facilities. For more information, call OLLI: (205) 348-6482. On the evening of Nov. 10, Staley will give a public lecture on his work and practice titled “Why Art Matters: A Potter’s Search for Meaning” in the Bryant Conference Center, Rast Room A, at 7:00 p.m.
Chris Staley’s visit is generously sponsored by UA’s College of Arts & Sciences, College of Continuing Studies and the Department of Art and Art History’s Visiting Artists Committee. Chris Staley is a Distinguished Professor of Art at Pennsylvania State University. He was selected to be the Penn State Laureate for 2012-2013. He received the BFA from Wittenberg University in Ohio. He was rejected by every graduate MFA program he applied to and then attended the Kansas City Art Institute for a year as a special student. He then was accepted to Alfred University and earned the MFA degree. Staley has traveled extensively as a visiting artist from Bezalel Academy in Israel to Haystack Mountain School of Crafts in Maine. He has received two National Endowment of the Arts Grants. His work is in many museum collections, including the Smithsonian Institution’s Renwick Gallery of the National Museum of Art, and the Victoria & Albert Museum in London. He has served on the Board of Directors at the Archie Bray Foundation and the Board of Trustees at The Haystack Mountain School of Crafts. He is currently serving as President for NCECA, the National Council of Education for the Ceramic Arts. His website is here. NOV 10 – 9:30-11:30 am and 3:45 – 5:15 pm: Ceramics workshops and demonstrations, Bureau of Mines #5. Call the OLLI office for more information on the workshops: (205) 348-6482. NOV 10 – 7:00 pm: Artist Lecture by Christopher Staley, “Why Art Matters: A Potter’s Search for Meaning,” Bryant Conference Center, Rast Room A, 240 Paul W. Bryant Drive.